Dec. 22, 2017 was not a good day for Maurice Alexander. The football team’s first bowl game in six years, the Bad Boy Mowers Gasparilla Bowl, took an awry turn in the first quarter. Then-senior quarterback Alex McGough fractured his collarbone. Uncertainty shrouded the Panthers as McGough, FIU’s all-time passing leader, exited the field. The Panthers would be forced to play the majority of the game without their leader. Enter the backup, Maurice Alexander. He had some quarterbacking credentials himself—he was a state-champion signal caller at Booker T. Washington High School—but replacing the orchestrator of FIU’s impressive 8-4 regular season was a tall task. Alexander would go on to complete 16 of 33 passes for 162 yards, two interceptions and zero touchdowns. 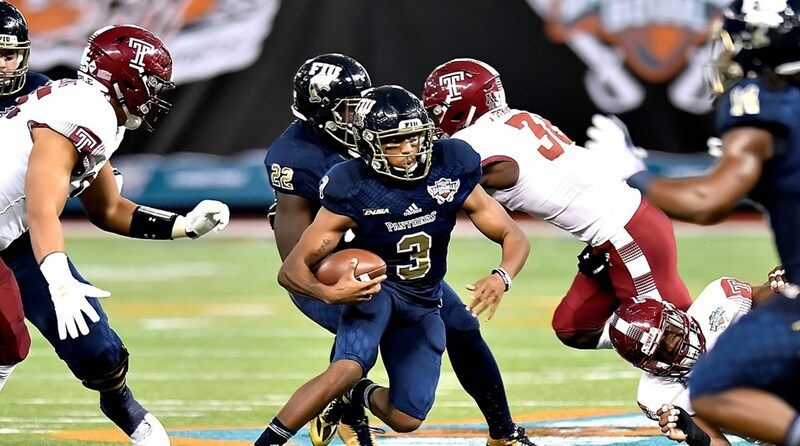 FIU lost to Temple, 28-3. That was a turning point for Alexander. In April, the junior took some time to pray and think about how he could best help the team in its upcoming season. His answer: playing wide receiver, a position he had never played before. Almost every day over the summer, he caught 200 balls to prepare for the transition. His experience in the Bad Boy Mowers Gasparilla Bowl taught him a valuable lesson: preparation is everything. “To be honest, I never thought Alex would get hurt. It was kind of bad to see that that was his last game. [Now I am] always ready to go. I know I’ll never be in that position again this time around,” Alexander said. Through 11 games in 2018, Alexander is the second-leading receiver on the team. He has 30 receptions for 416 yards and five touchdowns, and also 14 carries for 113 yards and a touchdown on the ground. He’s a major contributor on special teams, too, having fielded 12 punt returns for 219 yards and a touchdown. “He’s dynamic. He’s one of those kinds of guys that when you’re drawing game plans, you say, ‘How can I get the ball in this guy’s hands?’” head coach Butch Davis said. Alexander’s time at quarterback has helped him tremendously, he says. He knows where to expect the ball on a route, whether the defense is playing man or zone and other aspects of an offense that quarterbacks and wide receivers learn alike. “A lot of the time, [players] are leery and they say, ‘Alright, why are they moving me? I grew up being a quarterback.’ But his acceptance of wanting the team to win and his performance this year has just been reflective of him being happy where he is at.’” Davis said. Now, the football team is gearing up for another run at a bowl game, and possibly more. If FIU defeats Marshall University on Nov. 24, they will win Conference USA’s East Division and punch their ticket to the conference championship game for the first time in program history. Alexander will be a major contributor in the games to come, but that may have not been the case if he did not endure last year’s bowl loss with maturity. The football team will host its last regular season game against Marshall at noon on Nov. 24. For those traveling during the holiday weekend, the game will be streamed here.